Quite often I need to try a simple idea for a new service or app. My weapon of choice is currently nodejs and react. It is fairly easy to quickly hash out a server backend. Using create-react-app or NextJS, it is also quite easy to write a react frontend for said backend. This is all nice and well for a bit while you try out the idea for yourself. But no idea is really worth anything until it is shared with others. So now you need to host both the frontend and backend somehow, and point the frontend at the backend. This typically involves too many steps to make it feasible to try out the very simplest ideas. What I typically want, is a single server that can run somewhere that hosts both the backend and the frontend. Ideally just a Dockerimage. And I want this to just work without bothering with builds and such. After having done this for a few projects recently I decided to create a template so that I can reuse it whenever I need to try out the next idea. The result is in this GitHub repo. You now have a server on port 3000 that will restart when you change the server files, and will rebuild the client when you change the frontend. You are basically set to start materialising your idea. Once you want to share it, you can either use ngrok, or build a Dockerimage using the Dockerfile in the repo and host where you typically host things. When the image starts it will build the frontend. I do it this way instead of when the dockerimage is built so that we can set environment variables on the hosting platform easier. The repo sets up webpack 4, babel 7, react, express, and jest. The server runs in development mode or production mode. In development mode the server restarts when the backend code changes, and rebuilds the frontend using webpack on client code changes. In production mode the server builds the frontend on startup. It is called production mode, but I would not recommend this for actual production ready applications. But for a PoC this works very well. Feel free to open issues or send PRs on the github repo. I’ve been playing around with Home Assistant lately. I was surprised to not find a way to make external backups automatically. Most what I read recommended making snapshots and copy the snapshot over a samba mount manually. I wanted a way to directly make a backup and upload it to AWS S3. So late last night i threw an addon together. It can be found on github here. So at the weekend of my birthday I finally got the chance to sit down to work on a little project I’ve been wanting to do for a while. It was a gift for myself. 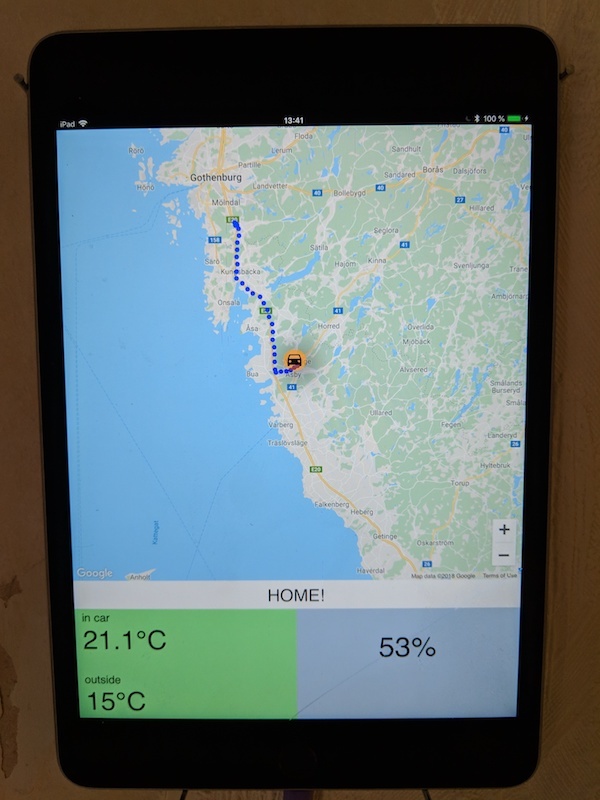 Essentially I wanted to build a simple app to show on an iPad in the hallway of our house, where my wife could see where my car is and how long it would be for it to drive home in current traffic conditions. It would also allow me to make sure it was plugged in to charge over night, as well as let me turn on the AC in the morning if it was cold outside. (Obviously the last part could be automated but I don’t always drive in so it would be a waste of electricity to do it anyway. Plus it force me to check the temperature and dress appropriately.) I completed the first version on the Sunday and I’ve made some minor upgrades since, but the core functionality is done. So how is it build? Well, my car is a Tesla Model S, and so it is essentially a computer on wheels. It has an accompanying app for my phone that let me control all kinds of things as well as give me its location so I can find it at a parking lot. Anything being controllable from a phone, means there is an API somewhere that can be used to do the same thing that the app can do. And Tesla is no exception. It is not official however, but fortunately it has already been documented by craftier people than myself and so far Tesla has made few attempts to prevent it being used so my hunch is that they kind of don’t mind. The overall architecture of the system is essentially a React app as a frontend, talking to an API that serves the app with info about the car, an ETA for when I might be home, as well as controls for turning the AC on and off. I have recently been working with Serverless and serverless architectures so I wanted to use that here. In short it means you write very small pieces of software that is invoked for a short period of time and then dies. It is run on servers somewhere, but you don’t have to care about where or how they are setup, just trust that your code will run when something triggers it. (There are books written on this and this is probably the shortest explanation I can manage so YMMV). The backend part is where the fun begins. There are essentially three components (although there are some support components as well). The first component is a function for getting the car state from the Tesla API. There are 5 routes used, that are aggregated and populated into a state object. This object is then put on a message queue in AWS SQS. Another function for saving this state in a dynamodb database is set to be triggered on a new message on the same queue. The update function is set to trigger every 1 minute using AWS scheduled events. 1 minute it she smalled time frame for schedules events. It is enough for now but I might need to change this in the future. Once the data is in the database the last piece is a HTTP GET route for fetching the last state to display in the dashboard. Once this was done, it was simple to add two routes for turing the climate on and off. I later added a route for fetching the last locations of the previous hour, to show on the map plotting the route I’ve taken so far which gives additional cues for my wife as to where I might be heading. In all this, I never had to touch a server configuration. I could focus on the code doing its thing. Btw, here’s the code on github. Last week I went to San Jose for a week to attend CHI. 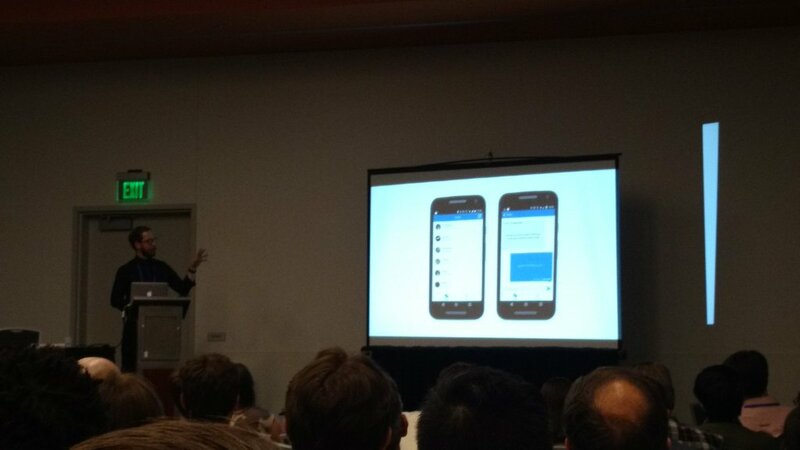 Among other things I got to present my note Forget-me-not: History-less Mobile Messaging. 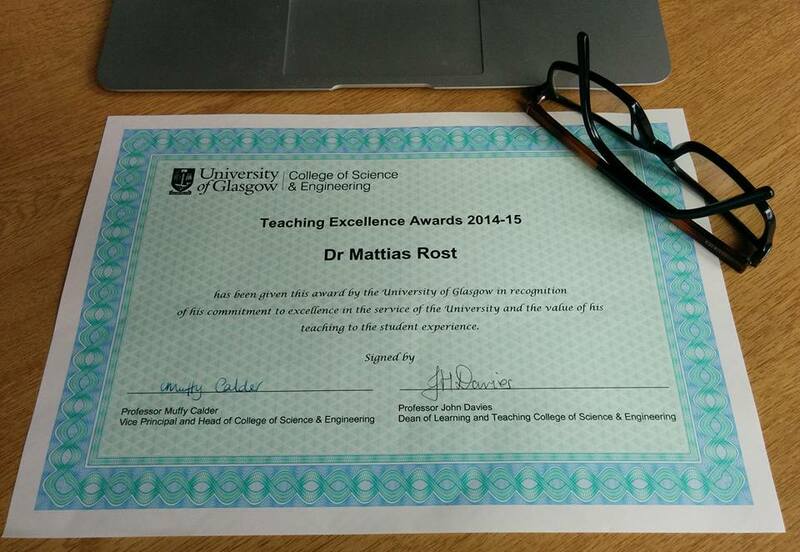 This note received an Honorable Mention which is given to the top 5% papers and notes at the conference. The paper is based on work done by a group of level 3 students. The group project was to design, build, and study a mobile text messaging app without history. This is what they did and turned into the app forget-me-not. The student project lasted a year, and throughout the project the students received first best presentation at the intermediate project presentations at half-time, and finally they received best L3 project in Computing Science in the school. I could not be prouder of these students. Topping that up with also being able to turn the work into a paper receiving an honorable mention surely is the cherry on the cake! The final paper discuss mobile text messaging and the role of messaging history. To do that we study what happens with mobile text messaging when there is no history. By interviewing 10 participants after using the app for 2 weeks, we gain insights into how they perceive the app, and how they perceive messaging through it. We found that messaging requires effort, but allows users to be relaxed about what they write. History turns out to be useful in the ability to “scroll up” to see the past messages which allows for distractions. Not having history instead makes it more engaging. It is also discussed how not having history allows for sending messaging you don’t want to have on record, such as bank details, or planning a secret birthday party. Read the whole paper, where we discuss the design of the app, and discuss the method of deliberately removing history to study history.